I created this recipe in June 2012. I tried to get all fancy and write the recipe in a document and save it so it could easily be clicked on, opened, and printed. Well, Apple did away with iwork, or at least the version I was using, so my recipe is gone. Just peachy. 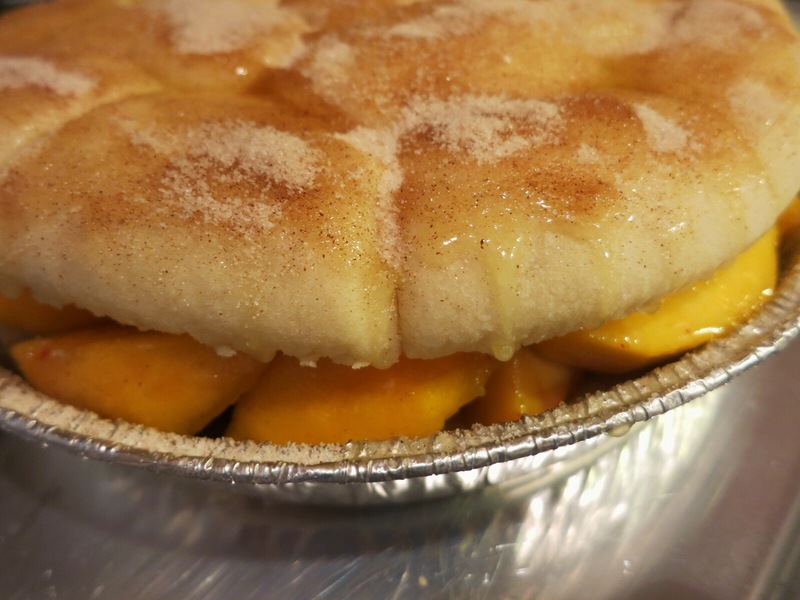 Here’s the back story: My pal Akili asked for a good place to find peach cobbler. South Carolina is the real peach state (yes, it’s true) and I happen to live in the peachiest part of it. Still, I couldn’t think of a place to go that serves a good cobbler. I’m sure it exists. I just couldn’t, and still can’t, think of it. So I figured I’d create one that she could make. Cobbler is technically fruit covered with a batter or biscuit. Putting on a bottom layer makes it a pie. I’ve made true cobblers and they’re delicious, but I was looking for something that was easy and substantial. I turned to my girl Sister Schubert. Every Thanksgiving, Easter, and/or Christmas meal involves a tin of her puzzle-like pillows of dough. This is a biscuit in its own pan. Do you like doing dishes? I don’t. Luckily, my partner in cuisine crime does them when I cook, but he hates it, too. Who doesn’t? 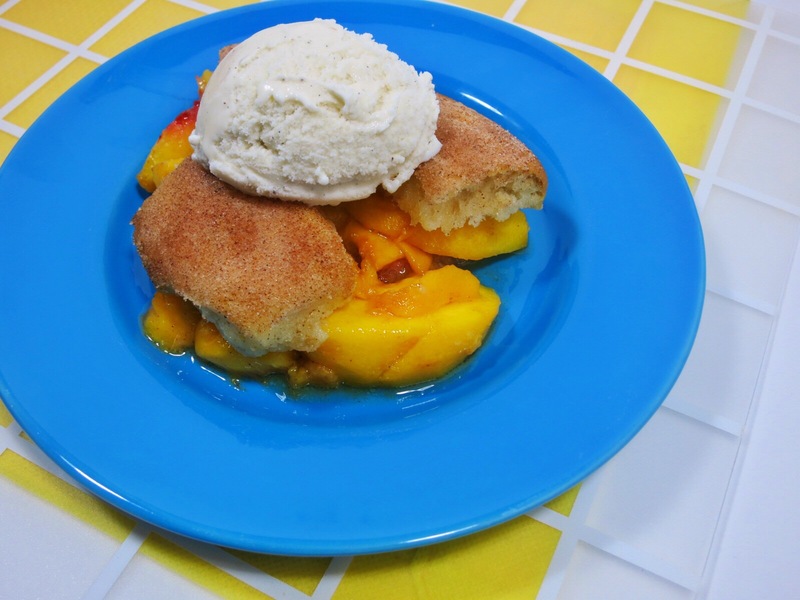 My original recipe involved cooking down fresh peaches… wait… this is a good time for a good point. FRESH peaches. Do not use canned peaches. Please, just don’t. They have a weird texture and they’ve done a yearslong backstroke in goopy gunk. If you can’t find ripe, fresh peaches go for the frozen ones. Just thaw them first. 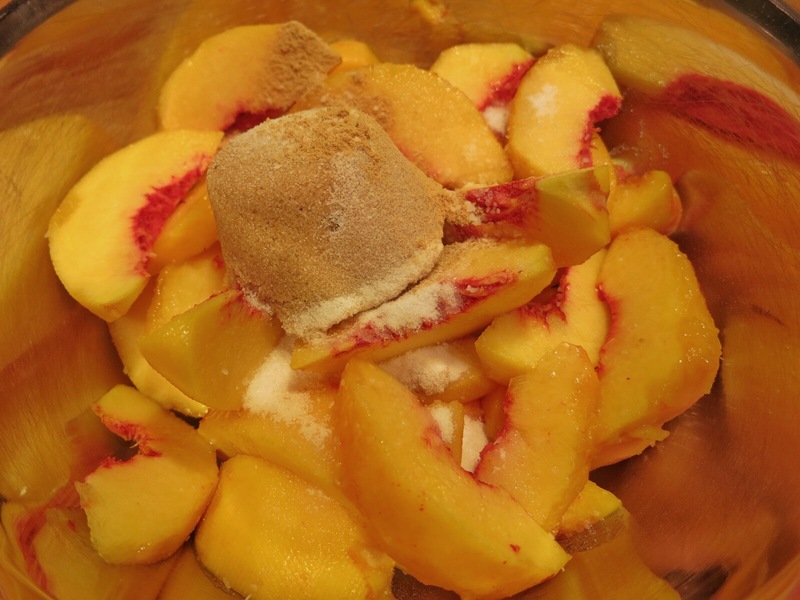 My original recipe involved cooking down fresh peaches with sugars, spices, and water. Then I added a mixture of cornstarch and water (called a slurry)… blah.. blah.. blah. The end result was delicious, but it was messy. 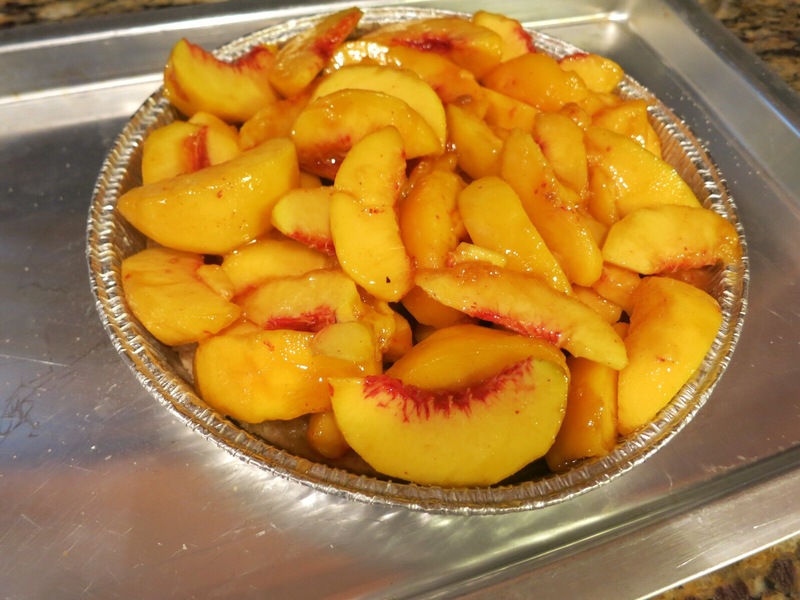 The added water combined with the natural juices of the cooking peaches led to a pool that often overflowed in the oven. I streamlined the process. It’s easier and nowhere near as messy. And my new procedure adds texture. You’ll see. Oh, and read the recipe in its entirety before deciding to make this. It takes some preparation. 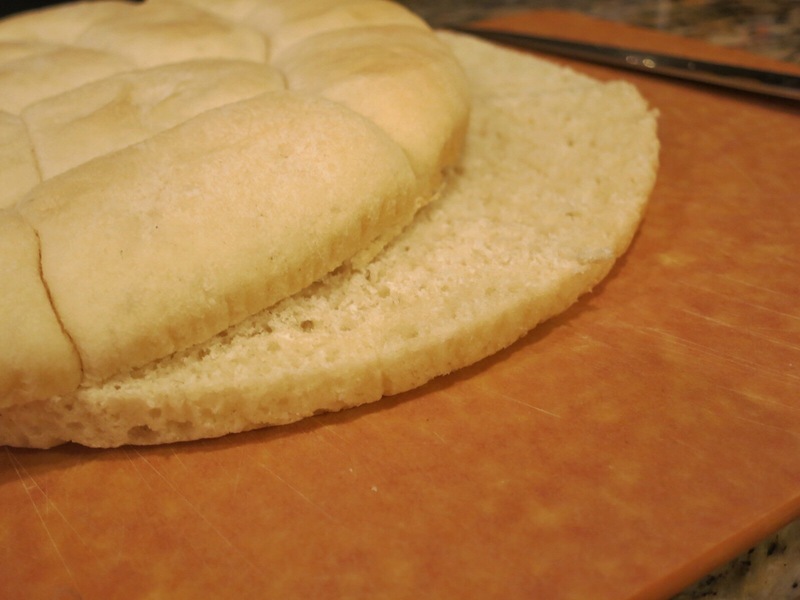 Thaw the rolls in the refrigerator for about 30 minutes. Then, take a serrated knife and slice the round of rolls in half, as if you were making a big sandwich and needed a top and bottom. Stack the halves, return them to the pan, put them back in the bag, and continue thawing in the refrigerator. You can do this a day in advance. Ultimately, it shouldn’t take more than an hour or so to thaw the rolls. When you’re ready to roll (haha, get it? ), preheat your oven to 350. 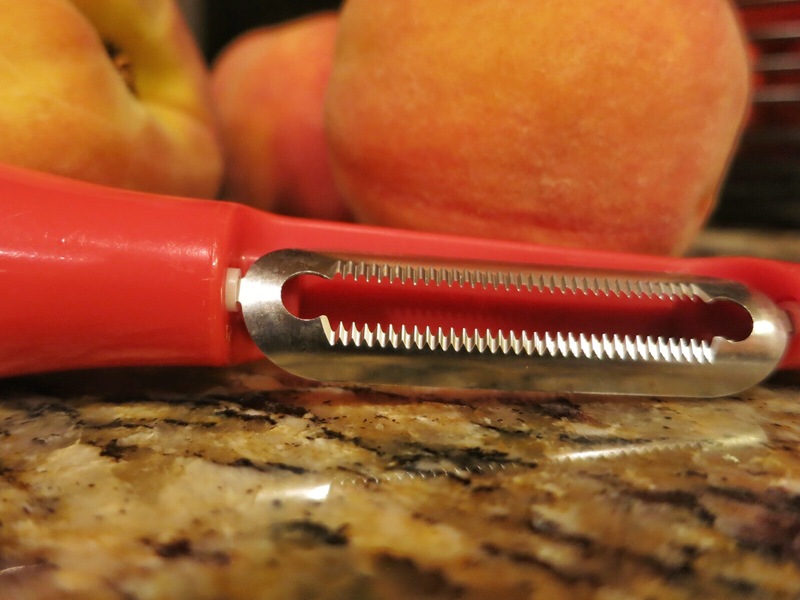 I use this handy dandy peeler with teeth that’s meant for peeling skin. My Aunt Karen introduced me to it. Be careful… it’ll take off your skin, too. If you don’t have one, slice a cross through the skin on the bottom of the peaches and drop them into a pot of boiling water for about 30 seconds. Pull them out. Drop them in a big bowl of ice water to stop the cooking. The skin should come off. If you have freestone peaches (the pit pulls out), slice around the peach like an equator, twist to open, and pop out the pit. Slice the peaches into wedges. 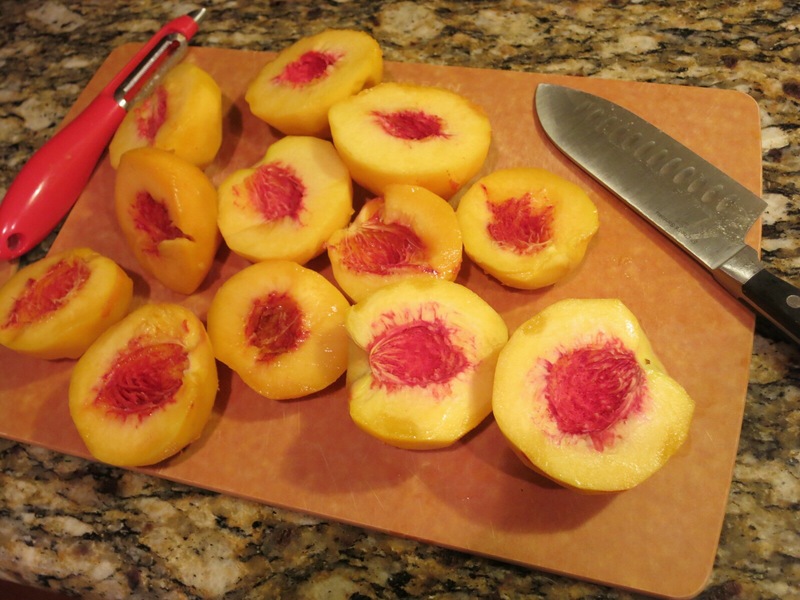 If your pit is clingstone (it stays put), then slice the peaches into wedges working around the pit. In a bowl, combine the peach wedges, ¼ cup brown sugar, 2 Tbsp. white sugar, ½ tsp. ground ginger, and a pinch of salt. Stir. 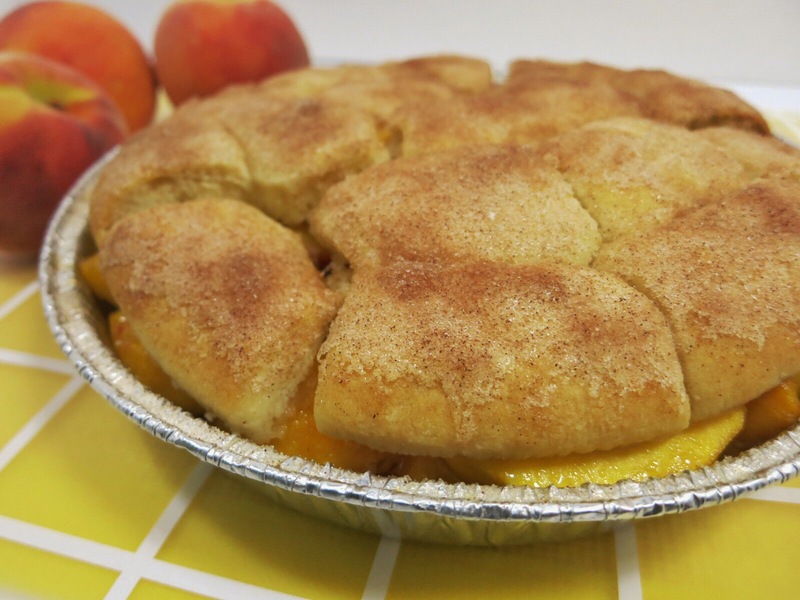 While the peaches and their new friends hang out and become best friends, melt the 4 Tbsp. of butter and make a dish of cinnamon sugar. In a small bowl, combine the remaining 3 Tbsp. of white sugar with the ½ tsp. of cinnamon and stir. 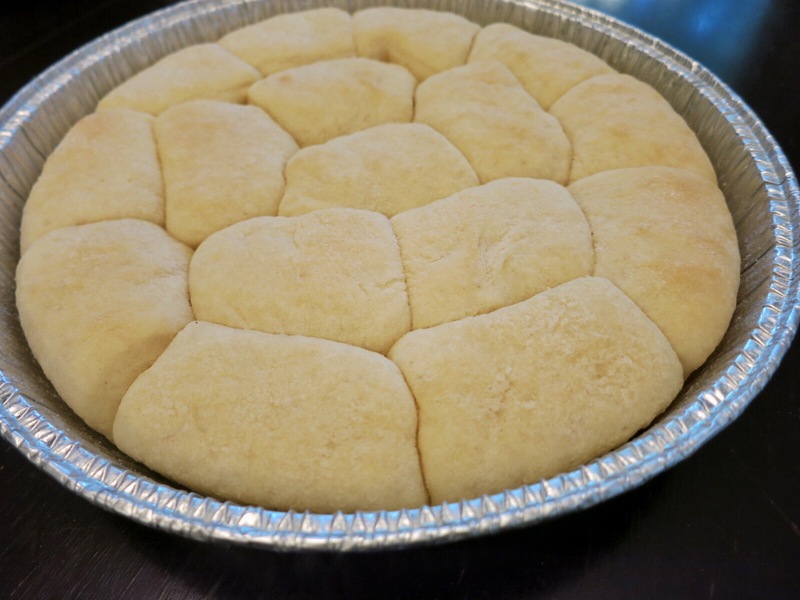 Take the rolls out of the fridge and carefully remove the top layer, setting it aside. You don’t want the roll tops to break apart. Leave the bottom of the roll round in the pan and brush it with 2 tbsp. of butter. Sprinkle on about half of the cinnamon sugar. Dump the peaches and all their juices onto the cinnamon sugar-coated roll bottoms. Put on the roll tops. Brush it with the remaining butter and sprinkle on most of the remaining cinnamon sugar. You want to cover the top of all the rolls. Set the cobbler onto a cookie sheet (just in case it bubbles over). Set a piece of foil on top of the rolls and bake an additional 10 minutes. Let cool about 5-7 minutes before serving. Scoop out big servings of the cobbler and top each one with a scoop of vanilla ice cream and/or a generous drizzle of caramel. The bottom half of the rolls soaks up all that sugary, gingery, peach juice. 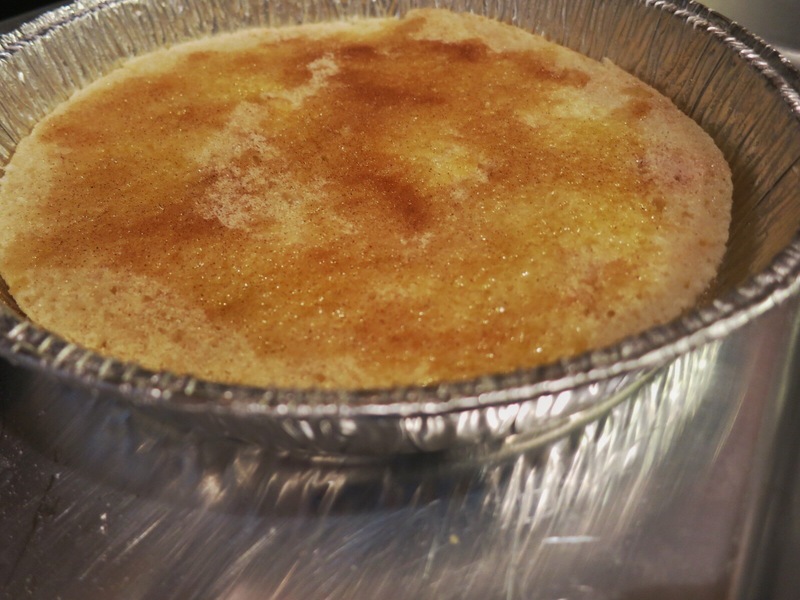 The top half is crisp with a cinnamon sugar crust. Both layers sandwich the sweet, softened peaches. 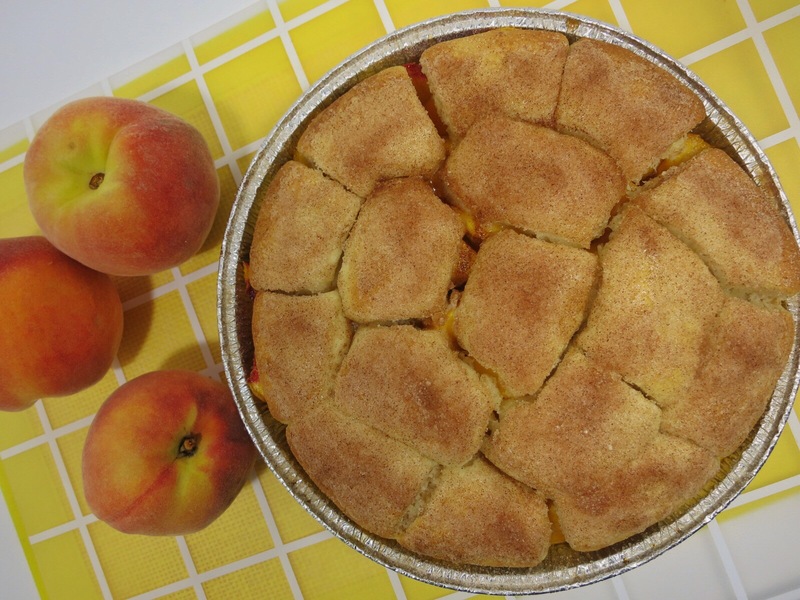 To me, this is a cross between a cake covered in peaches and a crumbly cobbler. 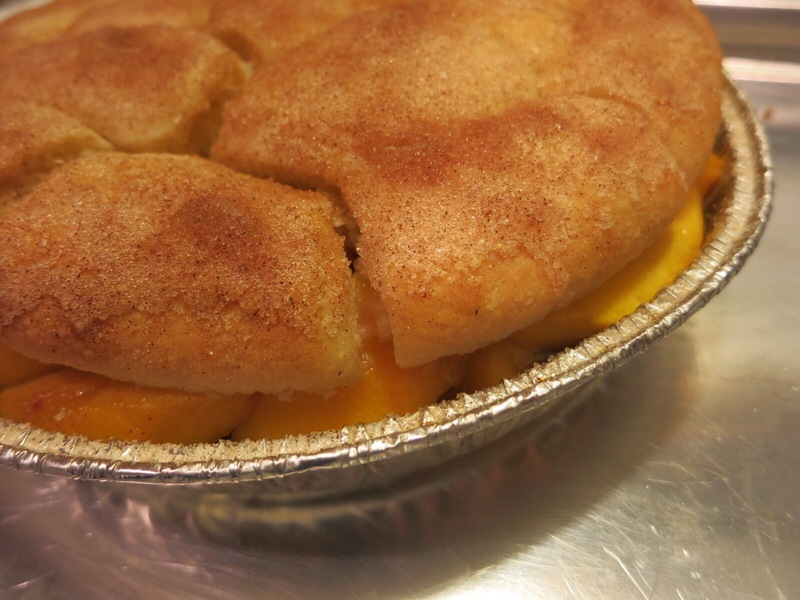 That’s why I called it my Peach Cobbler Schmobbler. No caked-on casserole dish to wash. When you finish the cobbler, and it won’t last long, you throw away the pan. Tip: Try adding fresh blueberries or blackberries to your peaches. Always taste your fruit first. If the berries or the peaches aren’t sweet on their own, add a bit more sugar.